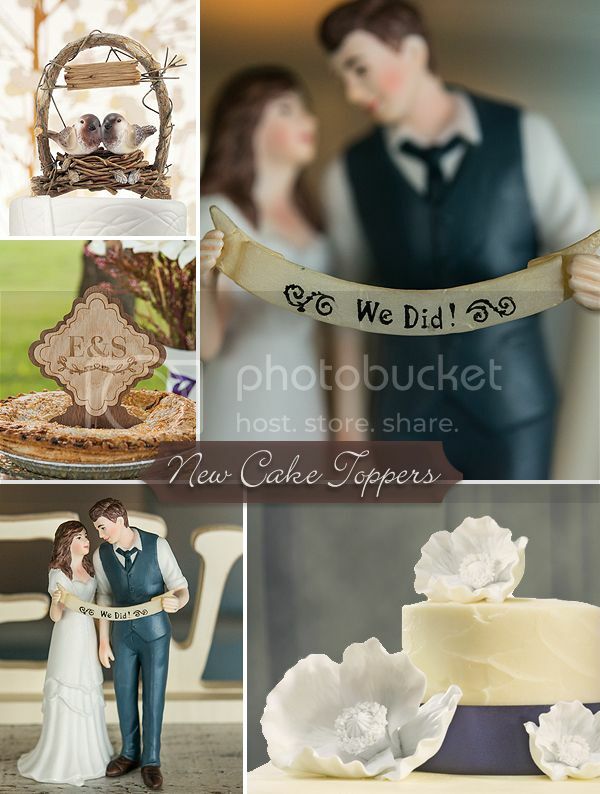 Every year our designers spend months dreaming up new cake toppers; their efforts are influenced not only by emerging trends in fashion, style and theme but by the Brides who have taken the time to share with us what they would like to see us create! 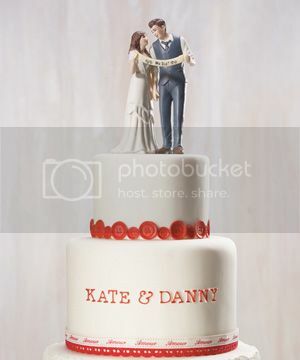 The following cake toppers are the result of all the work over the past year. Holding a banner than proudly proclaims “We Did!”, this indie couple is ideal for any vintage themed wedding. 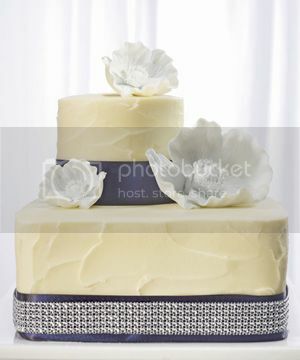 His grey suit and carefully styled hair are the perfect counterpart to her classically sweet wedding gown. Featuring an elegant up-do and modern wedding dress, this bride is classy and confident on and off the dance floor! *Custom hair and sash colors available. 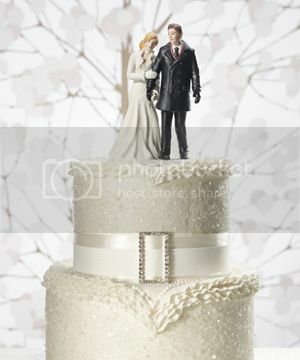 This cake topper captures some of the magic and romance of a winter wedding as the Bride and Groom go for a stroll on a crisp snowy day, hands tightly clasped together. 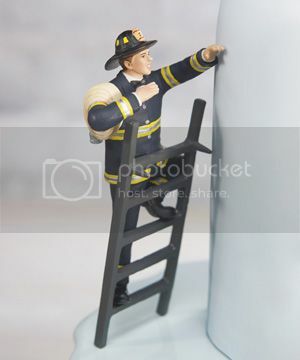 Celebrate your hero with this brave Fireman groom. 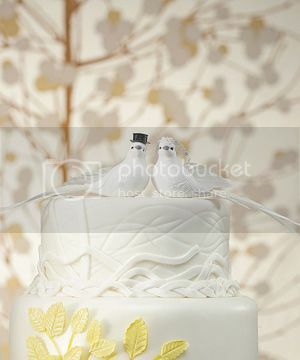 He can be paired with any of our mix and match Brides and sits comfortable on the second tier of the cake. Whether he’s carrying her across the threshold or sweeping his Bride up for a romantic kiss, this groom knows how to treat a lady. 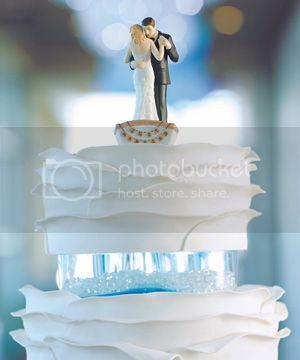 The bride knows that she’s finally found the man that isn’t going to let her go. *Custom hair and shoe colors available. Standing in a rowboat featuring a “Just Married” banner, this Bride and Groom are dancing to music only they can hear. 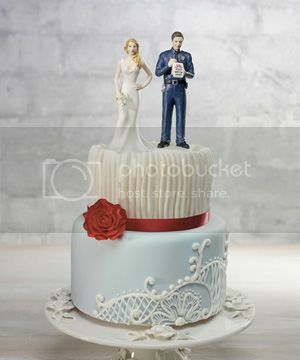 Shown here with our “Curvy Bride” cake topper, this Police Officer is dashing in his uniform. His ticket book reads “You stole my heart” and he features a heart shaped badge. This handsome groom can be paired with any of our mix and match brides to create the combination that is perfect for you! 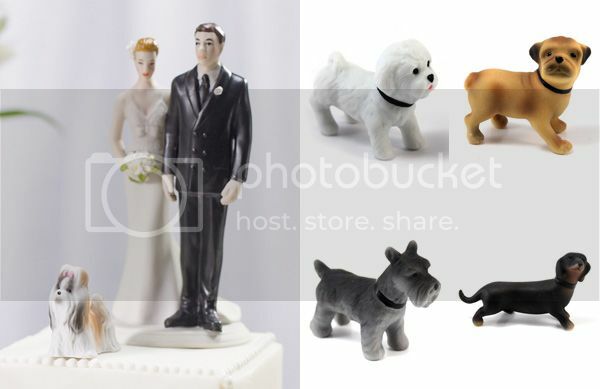 If your family includes a plus one of the canine variety, these puppy figurines can be added to the cake so no one is left out! The breeds currently available are Shih Tzu, Dachshund, Terrier, Pug and Bichon Frise. 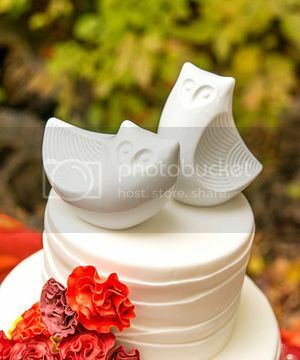 Whether you think owls are a hoot 😉 or you’re looking for an alternative to the classic love bird cake topper, these adorable creatures will top your cake with style! Pair them with our Owl Salt & Pepper Shakers to continue the theme. 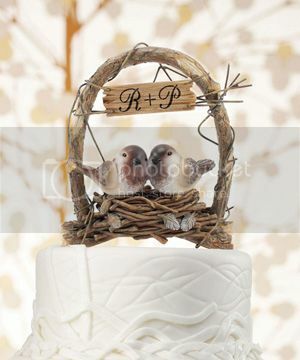 Made of poly resin, this darling cake topper won’t be leaving any twigs behind on your wedding cake! 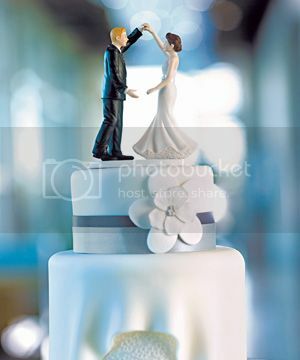 Whether you are having an outdoor or rustic wedding (or just happen to think these little guys are adorable), you can’t go wrong with this cake topper! Dressed up in a Top Hat and Veil just for the occasion, these little doves can be used to top your cake, add a little whimsy to your centerpieces or decorate your guest book table! These elegant blooms are a stunning option if you want to veer away from the more traditional cake topper. They come in a set of three with a small, medium and large flower. 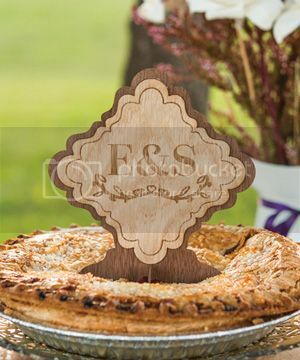 While this sign can be used as more than just a cake topper, it’s a great way to add a little rustic charm to your event. This sign will come to your door personalized with your Monogram or Initials. 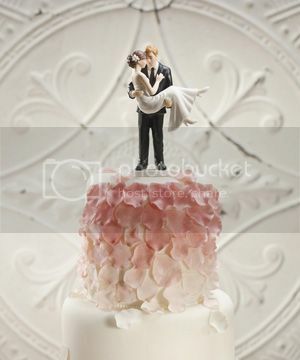 There you have it folks – our new selection of cake toppers for 2013. Is there a different topper you would love to see added to our selection next year? Be sure to tell us about it; your input is important to us and will help Weddingstar continue to offer new and exciting products!